An Easy Couple of Days – Let's Go RVing! After two pretty exhausting days we collapsed Saturday night. Knowing we were going to lose an hour of sleep did not appeal to us at all so we turned in fairly early. I had one of the best night’s sleep I’ve had in a while – perhaps I need to work a little harder during the day! According to the new time we slept until 9:30 or 8:30 old time. I don’t even remember when I’ve slept that long, maybe when I had the flu! It was an overcast day so we just took it slow. We couldn’t get to church and since we couldn’t get the cable working we had no TV church so we took care of things that needed attention around the RV. In the early afternoon we rode over to David and Jane’s to see them and the grands. Jane was at school trying to get lesson plans done for when she’s going to be out for Baby Olivia’s birth. On a side note, for all of you non-teachers out there, Jane will have six weeks of unpaid sick leave after her surgery however she still has to spend hours now preparing lesson plans for the substitute who will fill in for her. Doesn’t something seem wrong with that picture? After all as I was once told, teachers get off at 3:00 and if you believe that one I’ve got some prime land for sell! Back to the day – David asked Jerry to go to Lowe’s with him so I got to spend a little just GiGi time with Emma and Eli – precious time. We left about 5:30 as they had to get ready for school on Monday and we were planning to leave on Monday morning. We slept in again Monday morning this time getting up around 8:00 still much later than we usually do. 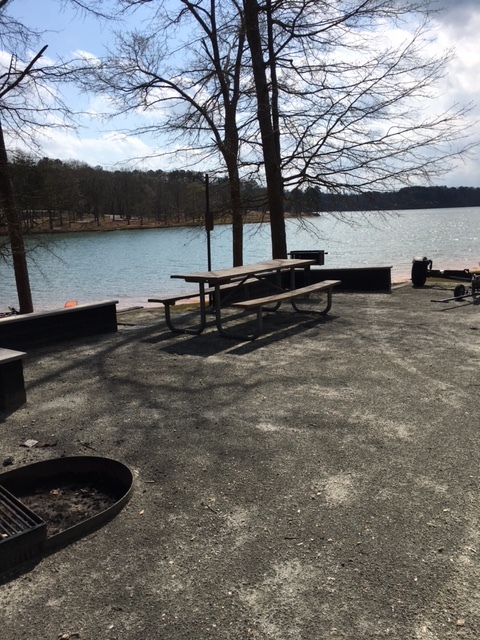 We pulled out of Tanglewood heading for Twin Lake Corps of Engineer Campground in Pendleton, SC about 200 miles from Clemmons and 200 miles from Perry, Ga.
We arrived just before 2:00 and it is absolutely everything people say a COE is. We have an absolutely lovely site right on the water and the day is beautiful although a little breezy. It’s not quite as warm as I thought but still a beautiful day and if the weather holds it will be a grand day for walking around this lovely place. Oh, by the way, with our America the Beautiful pass our site is costing us $13 a night. Not bad! In thirty minutes we were set up and after Jerry completed a phone call with Newmar advising them of the current situation Jerry fixed a pot of coffee and with coffee cups in hand we went on a brief walk around the grounds. It really is a lovely place and as far as we saw all sites are on the water. When we came back we sat outside for just a brief while but the wind was just too strong for me and I decided to go in. Jerry followed and we read for a while. I had put spare ribs in the crock pot when we arrived so they were cooking away. I had the potatoes peeled for potato salad so I completed the dinner preparations and we had a good meal. I feel like I haven’t cooked in the RV for a while because we did so much eating out on our Louisiana trip. Sunday night we just had a salad and a baked potato but tonight I cooked! Spare ribs, potato salad and fresh (from my freezer) peas. We cleaned up the table and put the dishes in the sink quickly so we could get a walk in before dark. There was even a possibility of finally having a campfire. As we began our walk we met a couple from Huntersville, NC and chatted briefly. Unfortunately before we got back to the coach it began to sprinkle so that ended our walk and our hopes of a campfire. Although there was very little tree cover we still couldn’t get the dish to see a satellite so we were dependent on local programming. Actually we just had another quiet night with no TV. In a way that is good – we’re missing all of the current politics. Jerry turned in about 10:00 and I was already in bed but couldn’t go to sleep. I think it was after 12:00 before I finally dropped off but it was not a good sleeping night. I woke up in the middle of the night and was amazed at how quiet it was, not a sound to be heard.